I started thinking about what I wanted the blog to do. I certainly want it to be about the store and what’s going on here, but I also want it to be fun. I really hope to share a little fashion knowledge here and there since I love fashion and designers and eras of great clothes. Did you watch American Horror Story: Coven? I did, and I still think about it even though it has ended. The reality is I think about Myrtle Snow. Her clothes drove me insane they were so fabulous. I loved that such a mainstream show went into such depth about fashion and some slightly more obscure references. She had some really great fashion, didn’t you think? I love the polka dot look, maybe because it reminds me of the Pauline Trigere suit we have in the store. Which, of course, reminds me of the February Vogue cover with Lena Dunham wearing the polka dot blouse. 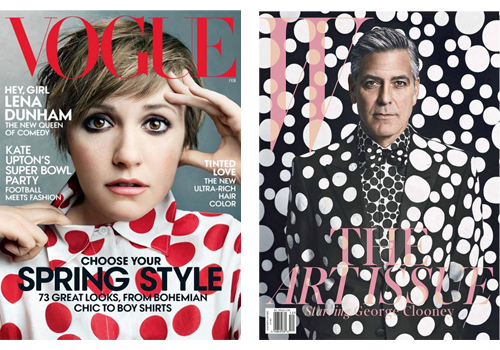 I think there was a W magazine cover a few months back with George Clooney wearing polka dots as well, wasn’t there? I actually wore a polka dot sweater for my senior portraits (and no, there will be no photos of that). How great that she has a Joel Rosenthal (JAR) sapphire and topaz harvester ant brooch that we never get to see because its beauty would blind us?. “You could never pull it off darling, only Lee Radziwll and myself could do it justice.” Lots of people don’t know who JAR is, (I only know because he was collected by Ellen Barkin and she sold off the jewelry that Ron had given her after the divorce) but I think it is very cool that the show educated while scaring. There was an exhibit at the Metropolitan Museum but sadly, I wasn’t able to see it…sometimes a boy has to work. Her final scene in the show, which if you haven’t watched it, I’m sorry for the spoiler, but I can’t mention Myrtle without it. 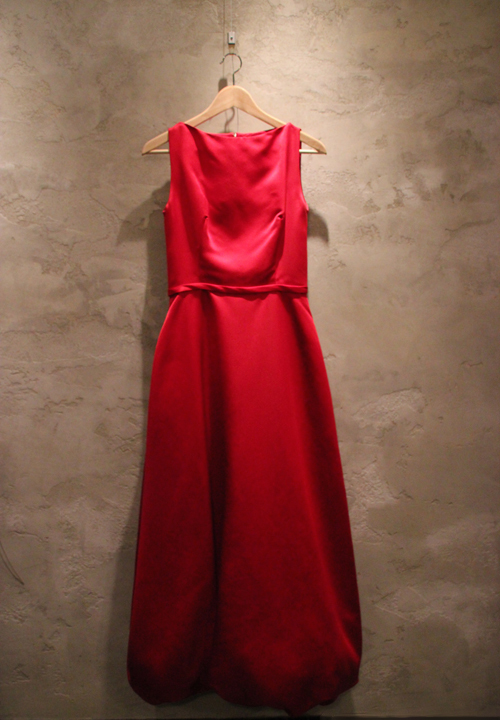 She is going to her destiny, being burned at the stake wearing a gorgeous red evening dress (not this one below, but I thought of it the whole time I was watching), and when asked if she has any final words only says one “Balenciaga!” How great is that? I would have said “Schiaparelli” but go with who you love. She also said a quote, that I will never forget because, A. it is amazing, and B. it mentions one of the greatest designers to ever live. “You’re just like Halston when he sold his brand to JCPenney–you’ve forsaken your destiny.” Reader, a little tidbit about me, I LOVE Halston. I love his look, his style, and his life. If I could pull it off, I would wear more black turtlenecks, all I’m saying. Anyway, her mention of a past designer speaks to me on so many levels. It is sort of what I do, looking at the past and present at the same time, recognizing the best of fashion then and now, and seeing the art in clothing. The show ended I think a month ago, but I still think of her- her style, her wit and her cigarette holders. Now…..if only I could do justice to a JAR brooch of my own.